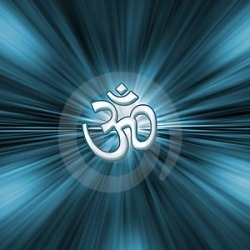 "Aum" a power chanting for creating powerful vibrations within the body and calming down the senses. "A" stands for Akara - When you Chant Akara your abdominal area recieves vibrations and relaxation, "U" stands for Ukara - When you chant Ukara all the vibrations are felt in thorasic and throat region. Whlie "M" stands for makara your mind recieves vibrations. A total relaxation while chanting AUM felt with the rise of pranas and radiating up above. AUM also stands for Devine qualities of Hindu Gods - Creater(Brahma), Preservor(Vishnu), Destroyer(Maheshwara). These qualities exist within each one of you and needs to be regulated to achieve right balance to lead successful life!. Create/Invent practices that add fresh values, inculcate Positive thoughts, attitude to Grow, attitude to be Constructive, consistently do better. These would be needed to adapt to changing world and finding simple ways of doing things. Preserve/sustain practices that add great values, nurture and regulate these qualities to sustain and control them to monitor descipline. Eliminate the practices that degrade the value, such as wasteful thoughts, negative thoughts, process that do not add any value, to be able to accomodate fresh values. Unlearning is important in learning process, so there is transformation in progressive direction. These are continuous and fundemental process for every one/ or organization/or a product to succeed and maintain longetivity.